Following up on the recent success in Virginia with his presentation based off of Dr. Szidarovsky’s renowned 2018 paper, “Alternative Multivariate Methods for State Estimation, Anomaly Detection, and Prognostics”, Ridgetop Group’s own Doug Goodman will be visiting this year’s International Test Conference (ITC) 2018 in Phoenix Arizona. Come talk to Chief Engineer Doug Goodman as well as CEO and President ,Tom Heiser, as they introduce the latest discoveries in multivariate algorithmic methodologies and how their introduction into your testing applications will provide the best indicator for system health through a combined measurement as opposed to traditional single variate analysis. This advancement in the algorithm for data analysis can improve your testing capability by broadening the scope of relevant inputs to narrow down the cause of failures. These advancements will allow you to improve the accuracy of you equipment by allowing you to distill multiple data points into a single health indicator (SHI) for a precise, singular measurement analysis to create a more refined picture of what actually caused a failure or anomaly. The figure below provides an example of various sensor reading types, including torque and temperature, and when a single health indicator is constructed, instead of the separate readings being interpreted independently (and as a result loosing interrelation) , we get a more accurate, combined single measurement. The new family of multivariate algorithms is now part of Ridgetop’s Advanced Data Analytics Reasoner tool set. Yes, we see it as a form of RADAR that helps find failures. Stop by and talk to Doug Goodman and Tom Heiser about licensing this algorithm to improve your test flow. 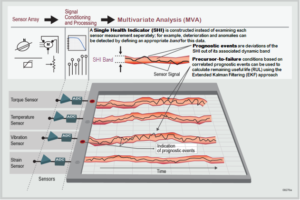 Ridgetop Group specializes in combining sensors, test and measurement techniques with proprietary data analytics in systems for semiconductor test and qualification, and Hi-Rel applications estimating remaining useful life in avionics and transportation. The research scientists at RGI continue to advance this predictive modeling technique that is commonly referred to as Prognostics. This entry was posted in Conferences on September 24, 2018 by Richard Thompson.